Let the gatherings begin in the welcoming gated front courtyard and the pool festivities continue out back. You will love the indoor-outdoor flow of this entertainer's home. 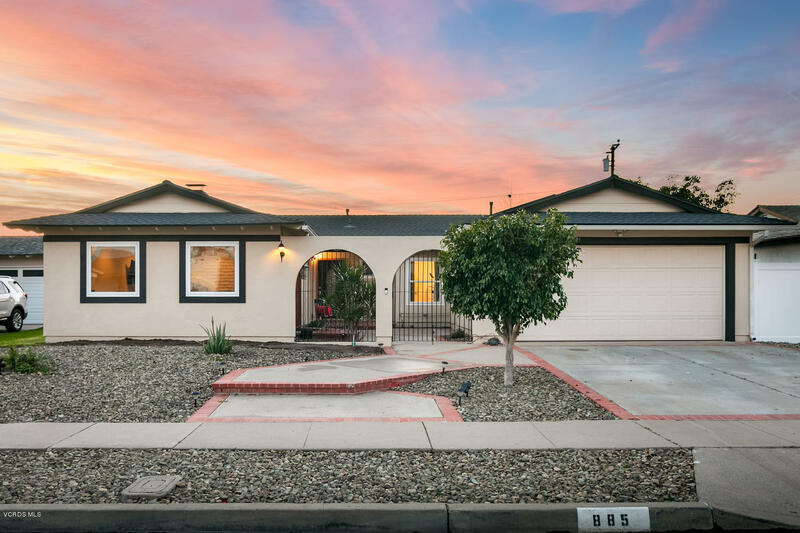 Centrally located, all-level 4 bedroom, 2 bathroom pool home is what the warm weather of Camarillo was made for! Enter the handsome front door to polished concrete flooring throughout a spacious 1, 752 sq ft. The sizable living and dining room areas are where life happens! Living room has French doors to front courtyard and agas start/wood-burning fireplace. Built-in cabinetry in dining room offers extra storage and a showcase for dinnerware. The kitchen, master bedroom and guest bedroom have access to the backyard. Newly built (2017) large pool and spa with baja shelf. Newer (2017) dual-pane tinted windows. New (2019) forced air furnace and ducting. Drought tolerant landscaping, dog run w/ turf and doggie doors to the home. Newer (2017) solar panels and cool shingle roof are exceptional added touches. Laundryroom off the kitchen and master bath includes new front loaders. 2-car garage with built-in storage cabinets. Walk to coffee or gather groceries at the Las Posas Plaza, and hop over the 101 for shopping at the Outlets or dinner and an IMAX movie.